A so-called nerve on a chip could improve designs of prosthetic devices that utilize electrodes, according to researchers who have developed the platform. 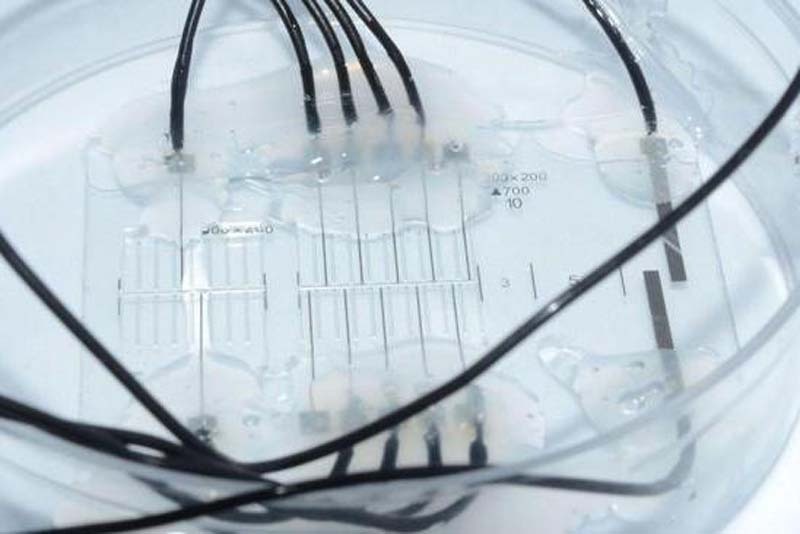 The miniaturized electronic platform, developed by researchers at the Federal Institute of Technology in Lausanne, Switzerland, modulates and rapidly records nerve activity with a high signal-to-noise ratio, based on a study of mice. Their findings were published Tuesday in the journal Nature Communications. The researchers believe their platform can be quite beneficial by restoring amputees' sense of touch, helping the paralyzed walk again by stimulating their spinal cords and silencing nerve activity of people with chronic pain. "Neural inhibition could be a way to treat chronic pain like the phantom limb pain that appears after an arm or leg has been amputated, or neuropathic pain," Dr. Stephanie Lacour, a professor at the institute's school of Engineering, said in a press release. These aspects currently aren't possible because of implants' inability to record neural activity at the right place and the right time. "Our brain sends and receives millions of nerve impulses, but we typically implant only about a dozen electrodes in patients," said Sandra Gribi, a doctoral student at the Bertarelli Foundation Chair in Neuroprosthetic Technology. "This type of interface often doesn't have the resolution necessary to match the complex patterns of information exchange in a patient's nervous system." Scientists developed the nerve-on-a-chip platform to stimulate and record from explanted nerve fibers the same way as current implanted neuroprosthetics. Microchannels are embedded with electrodes and the nerve fibers replicate the architecture, maturity and functioning of tissue. The platform was tested on rats' spinal cords. "In vitro tests are usually carried out on neuron cultures in dishes. But these cultures don't replicate the diversity of neurons, like their different types and diameters, that you would find in vivo," Gribi said. "Resulting nerve cells' properties are changed. What's more, the extracellular microelectrode arrays that some scientists use generally can't record all the activity of a single nerve cell in a culture." Importantly, they can record the activity of individual nerve cells. A photothermic semiconducting polymer, called P3HT:PCBM, was deposited on some of the chip's electrodes. The polymer heats up when exposed to light, allowing highly sensitive electrodes to allow for measurement of differences in activity between nerve fibers. The researchers developed an implant that can regenerate peripheral nerves by improving the geometry and position of recording electrodes. In running the measured neural data through an algorithm, they can calculate the speed and direction of nerve impulse propagation to determine whether a given impulse comes from a sensory or motor nerve. "That will enable engineers to develop bidirectional, selective implants allowing for more natural control of artificial limbs such as prosthetic hands," Lacour said. And it can be manufactured in a clean room in just two days, he said.